SHANGHAI - She was China’s first Winter Games gold medalist, a two-time Olympic champion and regarded as one of the finest short-track speedskaters of all time. “Definitely, winter sports is not very big in China. There used to be only two provinces that played winter sports, in the northeast of China,” Yang told AFP in Shanghai, where snow and ice are a rarity and summers fiercely hot. Yang, who won short-track gold in the 500 and 1,000 meters at the 2002 Salt Lake City Games, has more than 1,000 budding athletes training in ice hockey, figure skating or speedskating. They are age 3 and older in her program, which she started five years ago. It is beginning to bear fruit with nine of them called up to China’s junior team for short-track speedskating. “I am the mother of two kids and I always encourage them to experience sports because I believe it is very important for kids growing up,” said Yang. According to Yang, interest in her Shanghai club doubled as soon as Beijing was awarded the Games in 2015 — testament to the enduring pull of the Olympics. China’s tepid performance at the 2018 Pyeongchang Olympics underlines how far the country — which topped the 2008 Beijing Summer Games medals table — has to go in winter sports. China won only one gold — in short-track speed skating when Wu Dajing triumphed in the men’s 500 — and according to Yang, Chinese skaters buckled under pressure. 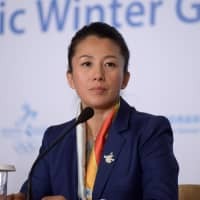 “For the elite sports we are going to build a bigger team and have a bigger budget,” said Yang, a member of the IOC who is closely involved in the 2022 Winter Games as chairman of the athletes’ commission. “In 2022 our goal is to participate in all of the events.